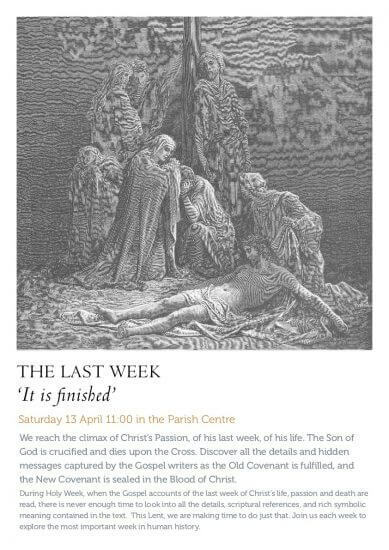 We reach the climax of Christ’s Passion, of his last week, of his life. The Son of God is crucified and dies upon the Cross. Discover all the details and hidden messages captured by the Gospel writers as the Old Covenant is fulfilled, and the New Covenant is sealed in the Blood of Christ. During Holy Week, when the Gospel accounts of the last week of Christ’s life, passion and death are read, there is never enough time to look into all the details, scriptural references, and rich symbolic meaning contained in the text. This Lent, we are making time to do just that. Join us each week to explore the most important week in human history. Talk takes place on Saturday 13 April in the Parish Centre. Cafe Neri open from 10:30.